We kids who lived around our area always looked forward to the “Stocking Fund Party” which was held every year at the Armoury, Greek Street. This was a charity for poor children. After tea and buns each child received one pair of stockings – this was very good, considering most of the kids had no shoes. One thing stands out in my mind regarding these parties. The wives of the officials of the town would act as waitresses to the children, and they made sure they would be on the picture that would appear in the local newspaper the following week, giving the impression that they were the local “Florence Nightingales” of the poor. There were many charities in the 1920’s for poor children and like most women on Hillgate my mother was not “behind the door” when anything was being given away. One day a close friend of my mother’s came and informed her of a charity that was giving away blankets to pregnant women at Stockport Town Hall. Being young I did not understand all of the conversation, but between their furtive glances I picked up words like “frightened”, “they’ll know”, “you do it”. What was all the mystery? Soon all was revealed, for the next day our neighbour appeared padded so as to appear in an advanced state of pregnancy, ready to claim her free blankets. What is more, she got them! We were always in front of the crowd when the clog fund was due. I think this charity came out of the police funds. Each child was given a pair of clogs. I had many pairs over the years but I must say I never looked forward to having them because the leather was hard and stiff and cut my poor feet to ribbons. The way to make the clogs comfortable was to go to Mr. Brewsters, the clogger on Hillgate, and he would let the kids put their feet, with the clogs on, into a tank of warm water. This would help the leather to mould to their feet. The school my brothers and I attended was St. Joseph’s Roman Catholic in St. Petersgate. This was a strict religious school, not given to sentiment over its scholars. In those days all the classes were housed in one big room with no partition. It was a case of one group of scholars learning about 1066, and another group singing “Faith of our Fathers”. Between them it sounded like a debate in the Irish Parliament. The teachers were very strict and fond of using the cane but if one realises the conditions they worked under, it is a wonder that they did not end up raving lunatics at the end of the day. Once a year the Bishop would come to the school to take us for a religious examination, and to give the scholars a test on what they had learned during the previous year. Two or three weeks before his visit it would be all go, and religion would be the main subject. If the class came out with good marks, we would be given as prizes religious cards to take home to show our parents how good we were. These religious cards, pictures of Saints etc, were much prized by some of the scholars. I am afraid to say I never came up to standard in these tests, so no prize ever came my way. It was a rough school in those early days. The best education you received was how to look after yourself, and the first thing you learned was how to use your fists. It certainly came in handy. Many of the scholars went to free meals but my brothers and I didn’t qualify for that – I don’t know why. Maybe we had other advantages. The teachers would wait on the boys as long as the food lasted: I must say [that] it was only on these festive occasions that I saw the teachers actually smile. After the feast there would be a concert, and the singing of Christmas Carols. The concert would consist of boys suing what talent they had to entertain. One of my favourite pieces was out of the “Christmas Carol” by Dickens. I had a speaking part in that, in the crowd scene, shouting “Merry Christmas” – that was the nearest I ever got to a theatrical career! Coming back in memory over fifty years, I cannot recall any of the scholars from my class going on to further education and achieving any academic qualifications. Of the boys I went to school with, two went on to become Roman Catholic Priests, a few joined the peace time army and two or three, I am sorry to say, served prison sentences. 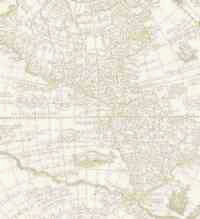 The rest joined their fathers, making up the vast army of hod carriers and navvies – and these included myself. In the years that followed many of these boys were part of “the unemployed”, eventually becoming soldiers and helping to defend the country in the Second World War. Many found resting places on the roads to Berlin, Rangoon and El Alamein. During my childhood days on Hillgate nothing was more tragic or heartbreaking than to see a family evicted from their home. This was a common thing around the area where I lived. Our family were nearly evicted many a time – it was only by the goodness of my grandmother that it was avoided. It was interesting for us kids to see an eviction. We would crowd round the unfortunate family’s house and watch the mother being led out crying the children and father following. The bailiffs would then proceed to take out of the house the sticks of furniture and put it [sic] on the pavement. In every eviction I witnessed, the same thing happened. The neighbours would look after the mother and children, but the father would sit down and look after the bits of furniture. At night he would go into the common lodging house. One case stands out in my memory even to this day. On my way to school I had to pass an old disused public house, once called the Black Boy on Lee Street. A family had taken up residence in this building. I knew the boy who lived there: his mother and father were quite respectable. However, one morning on my way to school I saw a crowd of people round the old Black Boy. Making my way to the front of the crowd I could see the old familiar scene – another eviction. Next morning, on my way to school, I again saw a crowd round the old pub. On looking at the scene, I saw three First World War medals placed on an old sideboard which the bailiffs had taken out of the house the day before. A lady in the crowd told me that the father had got back into the building during the night and hanged himself. The 1926 General Strike was a great time for the kids, both adventurous and exciting. We would hurry out of school to see the police on horseback galloping up Hillgate to put down a disturbance at the bus depot in Charles Street – this was a daily occurrence. No doubt many men not on strike were employed there. One job everyone had in those days during the strike, both adults and children, was to go on various rubbish tips around the town and pick amongst cinders for bits of coal. One day I was on the Oil Well Works tip on Bird Hall Lane. This site had its risks as the police were very active around this area. I was doing well - almost half a bag – when the boy on look-out shouted “cops”. Off I went leaving the coal behind – another night without a fire! The strike brought more than its fair share of hardship to the inhabitants of Hillgate but the housewives were solidly behind their men folk in this struggle, and I believe they would have gone to hell and back, eating grass on the way, before they would condemn their husbands or sons in their fight for better wages and conditions. 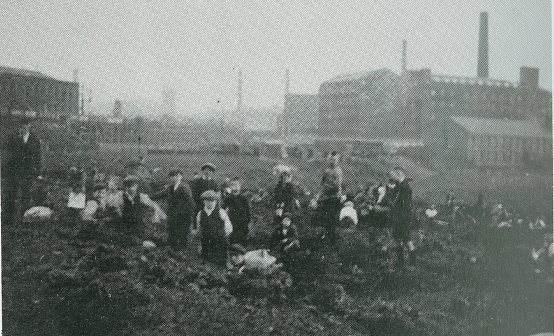 Picking for coal in Stockport during the Miners Strike in April 1921. The view would have been the same in 1926. The Board of Guardians worked overtime during the strike period. Our family had certainly had its share of handouts before the strike, but like Oliver Twist, we went back for more. My father was always shy and ashamed of going to the Workhouse for outdoor relief but I suppose the need was greater than pride and he had to go. He would go up Greek Street with two of the children. The children would push a box on wheels which we called a wagon, while my father played the part of the “Invisible Man”, afraid to be seen. He would then go into one of the Parish Offices within the Workhouse building and there state his case to some toffee nosed official who no doubt had never been hungry in his life. It was then up to this Parish Officer to allow a chit or grant of ten shillings or a pound’s worth of food. My father would come out of the office, his face white with embarrassment. What thoughts he must have had, a man who had fought for his country in two wars to go pleading for relief! He would then hand us children the grant and disappear. Being “old timers” we knew the drill. Off we would go round the side of the Workhouse and there received the food in our wagon – two large four pound loaves of bread, tins of corn meat (bully beef) and cheese, and back home to a good meal. There were shops in the area where we lived where it was possible to get twopenny worth of cheese, bits of bacon and the like. I think these shops catered mainly for lodgers in the common lodging houses. At night one could see these poor unfortunates coming out of the shops with their twopenny worth of tea, sugar, etc. It was a common sight to see children going into the shops with a basin for three or four penny worth of piccalilli, pickled onions, or jam. The shopkeeper would first weigh the basin and then give the appropriate weight of goods. One confidence trick that was worked on Hillgate in those days was that of getting a loan from the money lender. This would involve many families helping the one family who wished to get a loan. The housewife (it was always the women) would wait for the money lender to make his weekly visit around the area to collect his payments. She would then ask him to call at her house at some future date to negotiate a loan – the figure would be around £5, the repayment about £7. With negotiations completed and an appointment date fixed, the housewife’s plans would be made. The first act would be to buy a rent book from the newsagents for twopence and fill it up herself showing no arrears. Various items of furniture were borrowed from families in the street – a sideboard from one, chairs from another, and so on, (comradeship was wonderful in those days!). On the day of the appointment the money lender would arrive, look around, inspect the rent book, have a general look at the furniture, making sure that if the lady did not pay the loan back the price of the furniture would cover it. In the end the five pounds was secured. It is impossible to write about Hillgate without mentioning the Salvation Army. I cannot praise them too highly for their good work amongst the poor in that area, in spite of insults from the drunks and roughs. They seemed to go from strength to strength over the years and became one of the most respected organizations in the town. I have cause to bless the Salvation Army as I always looked forward to their Christmas Parties for the poor children of Hillgate. May they long carry on with their good work! There were many eating houses around Hillgate when I was a child – I don’t think the word “restaurant” was used. One such eating house was “Ginty” Booths, on Middle Hillgate, opposite the “Crown” (nicknamed “Corner Cupboard”). He would have three or four gas boilers placed near the wall inside his shop, and these would contain pea soup, tato (potato) ash and so on. It was said that if Ginty boiled his waistcoat he would have got a good pan of soup from it, for there was enough food splashed on it to feed a family for a week. There were also many reputable eating houses. I remember one a bit more classy than the others. It stood opposite the New Market, Middle Hillgate, in the 1920's. My brother and I used to go there for two penny worth of rice pudding with two spoons, and we would have “trys and turns" eating our dinner, making sure each got our fair share. We had to do that because he could eat quicker than me. We often had to have dinner out in those days, but I must confess we saw more dinner times than dinners. The reason why we had to keep away from the house during these school meal times was because of the bum bailiffs. My mother was more often in debt than she was out and often she would have to appear before the County Court for non- payment of debts. After her case had been heard, the sentence was passed - a fine of maybe two shillings a month would be imposed to pay the debt off. The cry from her would be "Jesus Mary and Joseph what will happen to us"? She always had visions of us all going up to the Workhouse to become inmates. I am sure if the Workhouse authorities thought that by any remote possibility our family would become inmates they would have put barriers across Greek Street to keep us out. Sometimes the debts were paid but more often they were not. When they weren't the bum bailiffs would appear. If they could get into the house they could confiscate the furniture for the debts owing. It's a good job they never did get in as I am sure they would have died laughing. The furniture we had was only worth about 50 pence. Fortunately for us they were unable to get into the house as my mother would keep both doors, back and front, locked from morning till night, until the Bailiffs left. The hours to work for them must have been from nine to five since we never saw them in the street before or after that time. During that time, however, we could not go home. One day when they were allowed into the house! 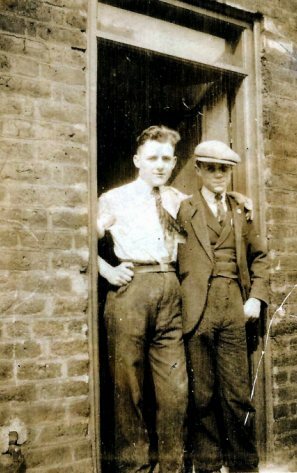 Jim and older brother George about the time of the General Strike. We presume that this is the family home in Mottram Street, Hillgate.